The Adelaide-born Black arrived in Sydney in 1915 and studied under Julian Ashton and Elioth Gruner. During the 1920s she was increasingly focused on 'modernising' her practice and in 1927 travelled to Europe in order to acquire (in her own words) "a definite understanding of the aims and methods of the modern movement and in particular - the cubists". She initially studied linocut printing at the Claude Flight Grosvenor School in London before moving to Paris where she enrolled in the Academy of the Salon cubist André Lhote. Black also worked briefly under Albert Gleizes in 1929 prior to her return to Australia. Black first travelled to Mirmande in the south of France in 1928 when she enrolled with her artist companions Grace Crowley and Anne Dangar in Lhote's summer school. It was here that Black here first experimented with painting the landscape according to Lhote's compositional principles of cubist-inspired geometry; where, as Lhote believed, the fractured planes of cubist construction were ultimately integrated into a rhythmically driven whole. 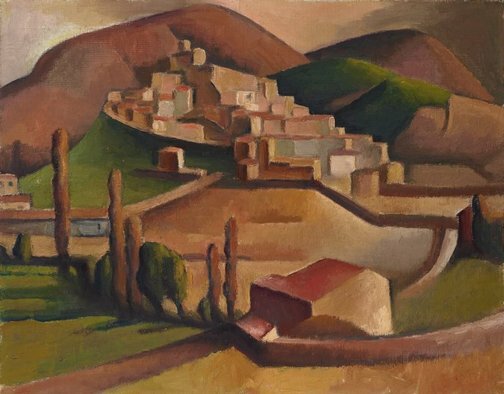 Mirmande remained entrenched in Black's artistic imagination and she returned in 1934 to once again sketch the pyramidal structure of the medieval hilltop village, later developing these works into paintings including 'Mirmande (and surrounding hills)'. The maturity and distinctions of Black's practice is evidenced by the painting's unified compositional structure of synthesised planes and volumes. It declares the shift in her aesthetic interest from the 'cubist', to the 'cubic' (that is, geometric) forms of composition. While creating a feel of sculptural density in the landscape's forms, Black's composition is driven by a lilting circular rhythm that guides the eye throughout the work and assimilates its angular forms. Mirmande represents the subject with which Black first interrogated ideas of painting the modern landscape. In 'Mirmande (and surrounding hills)' we see the aesthetic elements that she would apply to her subsequent Australian landscapes: indelibly solid while driven by a dynamic, rhythmic structure, and coloured in earthy sombre hues. Black applied these features to instil a sense of sombre monumentality to her landscapes and evoke the underlying and eternally vital forces of nature. Dorrit Black: unseen forces , 'Exhibition checklist', pg. 187-212, Adelaide, 2014, 191 (colour illus. ).